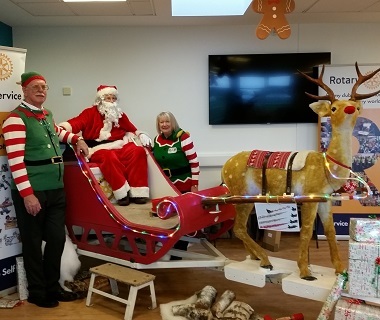 The first outing of the Rotary Club of Lincoln Santa Sleigh was at the Food and Gift Fayre at Lincolnshire Showground. A steady stream of amazed children (and some adults) had the opportunity to talk to Santa and take memorable family photographs. 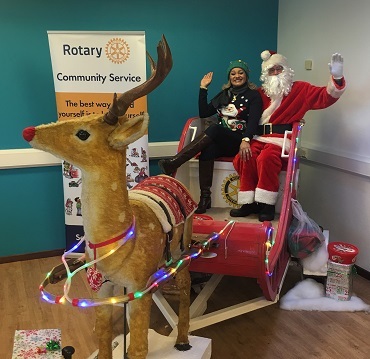 Elf (President) Malcolm and elf (Rtn) Jackie provide support to Santa. Elf (Rtn) Marcia takes time out to tell Santa what she wants for Christmas.